I think you are in a middle ground where there is no right answer but personal preference. Are you comfortable gaining enough fat to make a bulk worthwhile? Do you want to gain much more muscle or is it more about the looking lean? I think your answers to those will tell you what to do. Like personally I'd bulk in your situation because you're as lean as I would ever both going because I care more for size and strength (whilst not being too fat) than abs/looking 'good'. It's about your priorities. Lol at people thinking Matt Ogus is natural. As for the thread, why would anyone advise a 16 y/o to cut? Especially when they're not even fat. Just slowly bulk and gain strength and that's it. Am I an ecto/meso/endo morph bodytype? 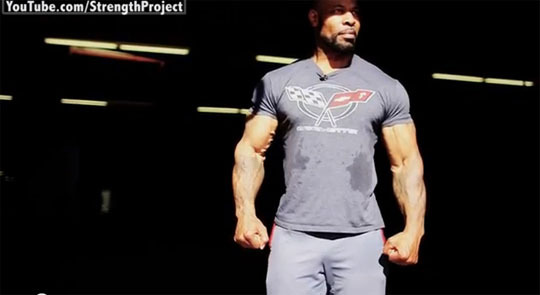 i think Ct fletcher is natural he is similar to kalimuscle i think he has been in one of his videos before. Kali muscle is not natural, it doesn't take a genius to figure that out haha I think it looks kinda gross tbh. Am pretty sure he has never stated he was natural or has he ?i don't follow him so i wouldn't know. I think he assumes that people know he not natural though. Although i think his body is horrible it takes an insane amount of dedication to achieve a body like that even if your on roids. Also there's loads of bodybuilding YTs that say they're natural but their body is beyond nature (KaliMuscle etc). Since its their job, I think if they admitted they weren't, they won't get as much views/subs. What's your opinion on KaliMuscle? He always admits he's natural. It got to a point where people were angry and we're making videos about him (I'll link you one). He claims he went to prison and he basically got big from there and that's where he obtained he's motivation and dedication. You look like you have the bodytype of an endomorph so cutting will naturally be harder for you than putting on weight. You will lose a lot of strength but when you hit 7% bodyfat you will look like a badass if you have cut properly since you look like you have a bit of muscle under that fat. Also you should learn about macronutrients if you want to learn how to bulk and cut properly.Follow some natural bodybuilders on youtube for some good advice (matt ogus) you will probably never get to their level of fitness so don't worry about looking like that if you are disgusted by it. I think ogus is natty am entitled to an opinion.People are going on as if they are 100% certain he isn't. Not sure about Ct fletcher but its possible, he has been lifting his whole life and during it constantly bulked. i think ogus is natural, not because he has entered natural bodybuilding competitions but because he sounds like he knows what he is talking about (macros) workout programs, supplements, coaching and he has been around YT for a while promoting natural bodybuilding even before he had made a name for himself. It's possible that Ct is natural. I'd take it you never been gym and don't know what muscle is/you have very little. I think doing gay for pay is a pretty strong indication a bodybuilder/youtuber isn't natty.. Drugs aren't cheap. INB4 Matt Ogus sat on webcam rubbing spit on himself for guys so that he could afford whey protein, Kali Muscle did gay modelling so that he could afford his tuna and noodles and Kai Greene drank his own *** to buy more grapefruits.